Tomahawk is a free and open-source music player that allows you to connect your other machines and friends via Jabber, Google Chat and Twitter. You can browse and play their libraries, playlists and stations. It also features a mood based smart playlist system, support for importing metadata from playlists from all over the web and other media players and a nice extension system to add more functionality. Tomahawk 0.5 has been released recently bringing in many new features and improvements. Better detection of local networks for the Local Network connector. Don't prompt for access permission for your own accounts. SOCKS5 proxy support improvements for resolvers and more. Initial Access Control support, allowing users to define who is able to access and stream from their collection. Priortize resolution of a track on double-click. Spotify Resolver can now be easily installed on-demand from the settings. You can now sync selected playlists (and updates) with Spotify. Support .aiff (AIFF mimetype) files. You can tell Tomahawk to stop playback after a certain track finished. Double-clicking a playlist name (in the sidebar) will start the playlist. 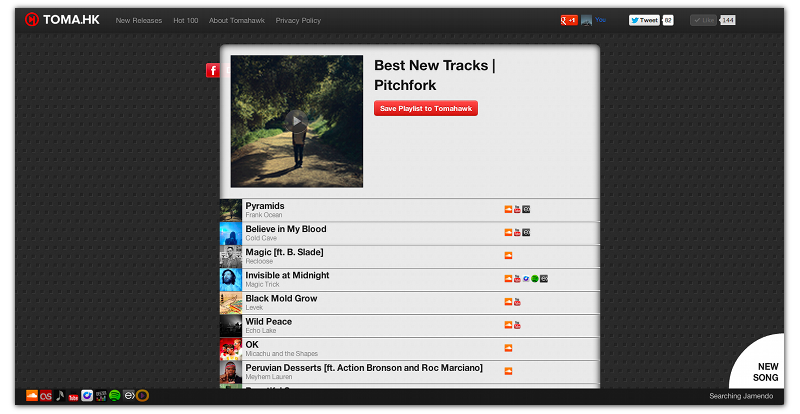 You can now import your entire Last.fm playback history into Tomahawk. Fixed sorting of related artists. Support for multimedia keys (Play, Pause, Next etc.) on Windows & Linux. When listening privately scrobbling to Last.fm and Adium is now disabled. Added a toolbar with page back / forward buttons and the global search. New grid-like view with direct playback controls. You can now browse new releases (by genre). Added social sharing widget, which allows you to tweet about a song. Added a track page showing a song's similar tracks and statistics. Separate Loved Tracks and Recently Played views per source. Combine an artist's albums into a single aggregated view. Added translations for Arabic, French, Bulgarian, Spanish and more. New Tomahawk logo and icon. Toma.hk web experience has been completely revamped. When you share a link to a song on Toma.hk, anyone can easily listen to it directly in their browser. This is done by supporting multiple services that are available all over the world, including: SoundCloud, YouTube, Official.fm, Deezer, Rdio, Last.fm, Ex.fm, Spotify and Jamendo. When you click play, it will playback directly in page using the best available source (with the exception of Spotify links which will open the Spotify application). If you use Rdio and your friends use Spotify, you now have a way to share tastes without being tied to the same service provider. Unfortunately Tomahawk packages have not been updated for Ubuntu 12.04 yet. You can either wait for couple of days for the packages to be updated or install them manually by following instructions below. Download 32bit or 64bit deb packages of all the files here. You can ignore files ending with dev or dbg. Once you have downloaded all the files (total 9), CD to the directory where these files are located via terminal and run the command below. Make sure that the folder have only these deb files and no other.